Quick Response codes, better known as QR codes, are a type of barcode that helps bridge the gap between print and online media. 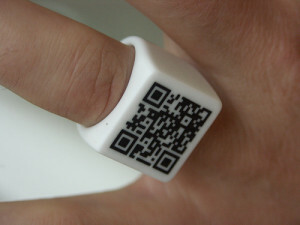 Smartphones equipped with QR code reading capability can easily scan the code from a print newspaper, magazine, or other “real world” artifact, and connect to linked content more quickly than by typing in a URL on a tiny smartphone keypad. The codes are already heavily used in parts of Asia such as Japan, and recent months have shown growing usage in the U.S., particularly in some of the more creative marketing campaigns. The ease of use is great for consumers, but is even better for content providers, PR folks, and marketers because the codes offer an easier way to measure return on investment (ROI). In addition to contest and treasure hunt angles, news organizations’ cultural, historical or events-related narrative projects might link the real and virtual worlds in interesting ways with these codes. They can be a way of getting more information to readers and inviting them to interact while retaining the ability to shape and control their story experience. 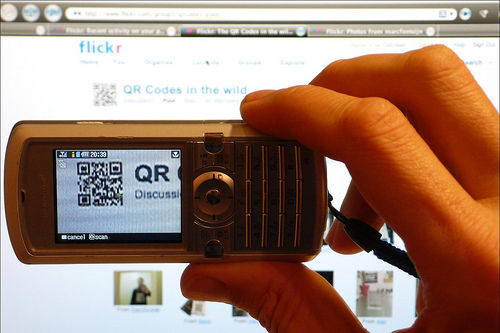 QR codes are showing up in the media world in less obvious ways, too. At the recent 2010 Online News Association (ONA) conference, numerous news organization employees included a code on their business cards, since job titles and other information changes so frequently now within the quickly evolving industry. She and her staff placed QR codes around the convention space. Attendees could hunt for them and snap photos of them to receive further instruction. Some codes revealed facts about the convention, but others notified the photographer that he or she had won a prize. Imagine putting QR code on every major intersection in your town. Then, people casually walking around who want to submit news tips can scan a QR code, which opens up the email address and phone number on a ‘Submit News Tip’ form. That form is sent directly to the reporter for that beat. For example, if you’re at your kids’ elementary school, the contact info from the QR code is sent to the education beat reporter. Sports bloggers could put up their own QR codes at local high school football stadiums and community golf courses for users to submit their kids’ scores and photos to the blog. For each submission via QR Code, there could also be a list of recently-submitted tips from that code, so you can see who else was there and what they cared about. The biggest hurdle is the fact that there are so many disparate applications that support QR code scanning, each with their own purpose or twist. […] It’s asking too much of people to make them distinguish between a regular barcode, a QR code and some other custom code. We need simplification and standards. The barcode scan is also heavily dependent on the user wanting to interact with it. They have to pull out their smartphone, load up an app and scan the code in question. Ring image by Fluid Forms on Flickr, used under its Creative Commons license. Mobile device image by CoCreatr on Flickr, used under its Creative Commons license.